This activity has gone through an observational review process. This resources was tested in a classroom and feedback was provided using this protocol. The activity was modified in response to the feedback. This activity seeks to have students analyze global data sets on earthquake and volcano distributions toward identifying major plate boundary types in different regions on the Earth. While the focus of the activity as written is on two NSF-MARGINS focus areas, any region of the Earth for which this data is available can be targeted. 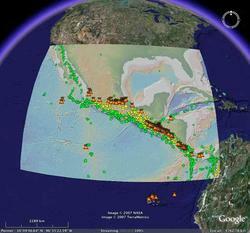 A secondary objective of the activity is to familiarize students with two publicly available resources for viewing and manipulating geologically-relevant geospatial data: Google Earth(TM) and GeoMapApp, a Java-based marine geoscience data resource and visualization tool maintained by the Marine Geoscience Data Systems at Lamont-Doherty Earth Observatory. Through this activity, students should become familiar with the concepts of plate boundaries and plate interactions, and the principles tacit in the theory of Plate Tectonics that most major geologic events occur during plate boundary interactions. Students should also become able to connect major geologic phenomena (volcanism, earthquake activity) to tectonic plate geometries, and recognize the "slop" in this relationship (i.e., phenomena often occur proximal to plate boundaries, but often not at the boundaries). Depending on how the activity is used, one can also have students model the kinds of data analysis skills that were necessary to the geoscientists in the 1960's who first looked at these kinds of global datasets. This activity can be assigned as homework, or it can be conducted in part as a classroom demonstration, followed by a homework assignment. Student access to Internet-capable computers, onto which Google Earth and GeoMapApp software can be downloaded, is essential for its use. How an instructor approaches the this activity will depend on the degree of facility students have with accessing Internet-based data resources - it may be that some how-to training for the use of such resources is necessary. Fortunately, both Google Earth and GeoMapApp are relatively intuitive software. The activity may be used, with some modification, in either introductory geology courses, or in Junior/Senior level courses on tectonics or petrology. Lecture and reading materials on the basics of plate tectonics, plate boundaries, and plate boundary interactions should precede its assignment. Provided is an example handout sheet for the activity, along with Google Earth kmz overlay files for the Central America/Gulf of California MARGINS focus areas. The images are "nested," so that switching from one to the next focuses onto a smaller and smaller region. Depending on how the images are viewed, one may wish to re-create them with different point sizes in GeoMapApp, which is relatively simple to do. The more recent versions of GeoMapApp permit customized color-coding and sizing of symbols, which might be a desirable way of preparing these files. Also, it may be necessary now to download the Smithsonian Global Volcanism Network kmz file for the positions of active volcanoes on the Earth, as newer versions of Google Earth may not include it as an upload. The Smithsonian file is updated periodically. Data and overlay files for the Izu-Bonin/Japan focus areas discussed in the handout (or overlays for any other region of the Earth) can be generated in GeoMapApp, and transferred to Google Earth in the form of .kmz files, produced as a "save as" option in GeoMapApp. Critical to the effective use of this activity is that the instructor become facile in manipulating both Google Earth and GeoMapApp. Fortunately, this is rather easy to do. As with much of science instruction in the Information Age, what students need is to learn how to access and interpret information, so anticipate "mechanical" questions related to the use of the applications, so as to address them quickly and move on to examining the data. It may be necessary to ensure that students grasp the necessary functionality in GeoMapApp, and even in Google Earth. Students aren't as familar with these resources as investigative tools as an instructor might expect. It's also a good idea to discuss the similarities and differences in the datasets represented by GeoMapApp (especially the Virtual Globe presentation) and Google Earth. It may also be useful to do a geographic orientation with students - where in the world IS the IBM or Central American MARGINS focus site? A quick pre-activity exploration of Google Earth and GeoMapApp, as part of presenting these tools to students, might be sufficient. The fact that these sites will look different in each of these GIS viewers is a conceptual obstacle to some students. My approach to assessment in this activity is to develop rubrics for evaluating student responses to the two sets of questions. How the rubrics are cast will depend on how the activity is used (i.e., straight homework, an in-class computer lab, or as a lecture/homework combination) and the level of the student audience. The questions are intended to ultimately get students past the simple identification of plate boundaries, though making these identifications from the combined earthquake and volcanic datasets is obviously a big part of the activity. Earthquake Epicenters for Costa Rica/Cocos area. Sandra Swenson, CUNY John Jay College, created this rubric for use with this Mini-Lesson.